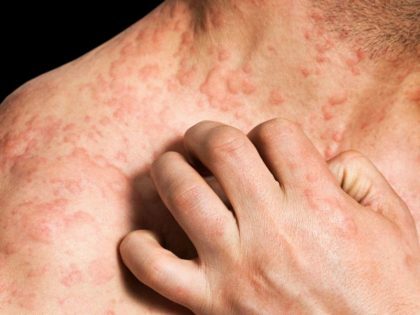 A genetic mutation could be the cause of severe eczema, according to new research published June 19 in Nature Genetics by researchers at the Uniformed Services University of the Health Sciences (USU). Researchers believe these new findings could influence new treatment strategies for the millions of individuals who struggle with this chronic condition. The study, “Germline hypomorphic CARD11 mutations in severe atopic disease,” was led by Dr. Snow in collaboration with researchers from the National Institute of Allergy and Infectious Diseases at the National Institute of Health (NIH) and other institutions. They found that glutamine, an essential amino acid needed for normal immune cell functions, which patients can also take as a supplement, might help correct the cellular defects that likely contribute to severe eczema. Until now, patients with rare genetic mutations shown to cause severe allergic symptoms also suffer frequent infections and other severe immune system defects. In this new study, sequencing the genes of eight patients with severe eczema from four different families revealed they had mutations in the CARD11 gene. Some of these patients had other accompanying health issues, like infections, but others did not. The researchers were then able to determine that mutations in this single gene could cause severe eczema even in the absence of other medical issues. The team of researchers also sought to understand why these newly discovered CARD11 mutations contributes to severe eczema. They found that although each family had a distinct mutation affecting a different region of the CARD11 protein, each mutation disrupted its normal function in T cells — an essential type of white blood cell. Interestingly, they found that glutamine, an essential amino acid needed for normal immune cell functions, which patients can also take as a supplement, might help correct the cellular defects that likely contribute to severe eczema.